What happens to a group of young British schoolboys when their plane is shot down and they land on an island, lost in the Pacific? They are alone, with no grownups to tell them what to do. How do they live? Who leads? Who resolves conflicts? Who survives? Ralph is only twelve, but he’s a natural leader and the boys vote him chief. Jack is strong and wants to hunt. Piggy is smart, but he’s fat, asthmatic and nearly blind without his glasses. And most of the boys, especially Jack, hate Piggy for his weaknesses. Lord of the Flies is the ultimate story of group dynamics. It’s both engrossing and frightening to see the boys struggle with the enormous stresses of survival and the additional problems of trying to govern themselves. They come up with impressive ideas and seem to be off to a good start. But as time passes, Ralph and Jack emerge as competing leaders. Their system begins to crack when priorities alternate in importance. While Jack and his hunters care only about killing pigs, Ralph knows that keeping the fire is most important. As Ralph clings to the hope of being rescued, Jack immerses himself in the strategies of the hunt. Amid questions of leadership and the fear of a mysterious beast, Ralph and Jack position themselves for power and control. No spoilers here, but what follows is an alarming descent, full of savagery and devoid of morals. 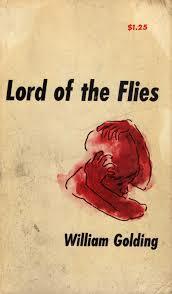 I really enjoyed rereading Lord of the Flies. It’s a great example of how groups break down under stress, how power can shift between people, and how the difference between right and wrong is either held onto or altogether ignored. While the story would be interesting with a group of adults, placing children in the situation instead shows the how the behavior develops regardless of age. And the loss of innocence makes the story all the more intense and sad. Golding has included a great combination of characters, with plenty of conflict and things to think about. I especially like the friendship between Ralph and Piggy, how it starts and how it changes. Simon is the one I think about the most. He is weak, but he’s prophetic and I still want the boys to pay more attention to him. In addition to these characters, one of the most interesting things Golding shows is how there’s a whole group of boys who are just along for the ride. They don’t seem to care either way what decisions are made – they just follow the one in power. It’s easy to make that parallel to group situations around us, both large and small. You can just roll your eyes when the situation is an ordinary one, but just imagine when it’s a matter of survival. I got a lot more out of this book the second time around and I give this excellent story five stars for its timeless relevance. I love this book. I read it as a kid and enjoyed it, but it wasn’t until I read it as part of a class that I fully appreciated it. I analyzed it through the lens of Freud’s concept of id, ego, and super-ego and my friend analyzed it using biblical references. We had a great time discussing all the different ways to look at the novel because Goulding’s prose is so rich. Have you read Pincer Martin? Thanks for reading and taking the time to comment, Elizabeth. I reread LOTF last year when my son read it and got a lot more out of it the second time. I have not read Pincer Martin – what’s that about?